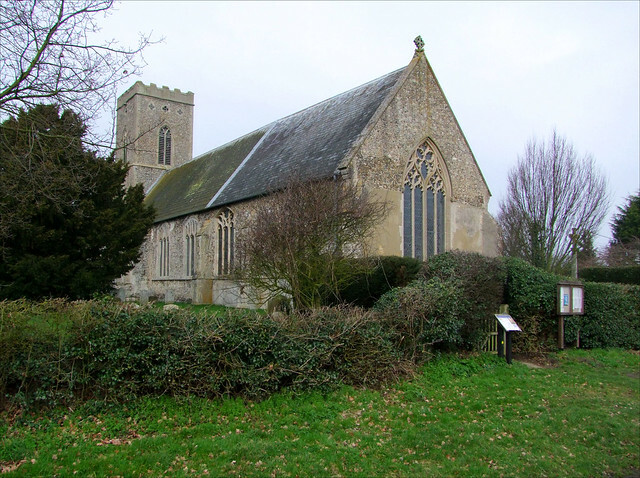 Just south of the strange landscape of Wortham Common, and away from the horrible A143, head south towards Mellis, and not long after, you will see this ship of a church riding the western fields. For me, the view is quintessential Suffolk; a great medieval tower raised above simple council houses, surrounded by hedgerows and barley fields. There is no big house, no great hall, just the homes of the ordinary people. What a sight it must be if you have been away from it for very long! And yet, for several reasons, this is a most unusual church, and there isn't another like it in the county. This won't be apparent from the outside, however, so instead you can admire the fine Decorated exterior, reasonably unfamiliar in this land of Perpendicular, and if it is a little over-restored by our friend Phipson, it still retains the patina of age that is more easily effaced in its architectural sequel. Coming back to it on a crisp February morning in 2011, I was struck again at its organic feel, a natural growth in this intensely agricultural setting. St Mary is tightly hemmed in by its hedge. A large cross looms in front of the east window. The cherry trees by the porch which I had seen in full bloom nine years before were gone, except for one survival - the nice lady I met inside the church told me that they had simply died of old age. Again, I was struck by how friendly and welcoming the people in this benefice were. The war memorial has been mounted in the porch, although there is another rather more remarkable one inside, as we shall see. Before going in, I made sure I looked at the two headstops to the arch. They are portraits made in the late 1980s of the two churchwardens, Harry Baker and Billy Garrod. You step into a screened area at the west end of the church, designed in the style of a baptistery as at Gosbeck. But this is altogether on a grander scale, and beyond the lovely font, with its dedicatory inscription to the Burgates, there is another screened area, which we will also come back to in a moment. The former vestry in the south-west corner, which I had seen in 2002, has now gone, to be replaced by a meeting room and kitchen conversion beneath the tower. The west end now feels more open, but the devotional organ screen is still a memory of the Church of England as it was half a century ago. Stepping through the doors of the screen into the body of the church, you find that Richard Phipson was pretty thorough here, and this is to all intents and purposes a Victorian church inside. There is no division between nave and chancel, the body of the church continuing eastwards the same width. In the north side, there are some fragments of medieval glass, including what may be part of an image and label of St Augustine. However, the most striking feature is the tomb of William de Burgate and his wife Alianora. This stands lengthwise on, directly in front of the altar. On top of it sits one of Suffolk's three finest brasses (the others are at nearby Redgrave and far-off Acton). William died on the vigil of St James the Apostle 1409, and Alionora died - well, we don't know. Her date has been left blank, a not uncommon occurrence. It is an awesome piece, and the whole building revolves around it. There is a near-replica of it twenty miles off at Haughley. And yet, even while taking it in there is the distraction of the quite extraordinary side altar set against the north wall beside it. It is a shrine, a chapel of remembrance to those named on the memorial in the porch. It is the work of the Reverend Appleyard, who came here in 1919, and who was largely responsible for the Anglo-catholic makeover that this place received, and which it has never really recovered from. The thing that makes it remarkable is that all the candlesticks and furnishings are made out of shell-cases, supposedly by soldiers in a field hospital in Flanders where Appleyard was chaplain. He built the altar itself, which is set in the entrance to a former chapel, not an Easter sepulchre, as several guides suggest. If you look just behind it to the east, you'll see his helmet. Another remarkable feature of the altar is that, as well as naming the local lads who were slaughtered in northern France, it also carries the names of the two medieval de Burgates. And, as if that was not enough, St Edmund, King and Martyr. I suppose that they all died in battle of a kind. The little figure of the French Saint Bernadette was also presumably brought back from the killing fields. If you want to see what Appleyard looked like, his portrait is up in the screened off area to the west of the main entrance, along with all Burgate's other Priests back into the 19th century. Back in 2002, the then-churchwarden showed them to me, pointing out that Appleyard was 'a bit of a tyrant'. I assumed he was speaking from memory. This area was Appleyard's chapel of St Edmund, a neat solution in a church with no aisles. and at the time of my last visit it had fallen into disuse, although there were plans to restore it to use. I was pleased to discover that this has now happened, and it is a beautiful devotional space in use for small-scale communions with a delightful icon of the patron Saint. All around the church are the decorative and devotional fittings of almost a century ago, when the Church of England was at the height of its powers. The Reverend Appleyard created an interior where the power of devotion overwhelmed all wordly things. Perhaps there are many churches that were once like this, but they have been slowly cleared of clutter as the years go by, and now Burgate is one of the few that is left. I mentioned to one of the ladies inside that another writer had compared this church to an ecclesiastical junkshop, but she just laughed and said she didn't mind. "We like it like that!" she told me. And so do I.